Effective: Invisalign clear aligners can treat a wide range of teeth-straightening conditions, including crossbites, crowding, open bites, spacing, overbites, and underbites. Convenient: Invisalign treatment is ideal for your busy schedule, since you only need to visit our office every 8-12 weeks. We will use the iTero® digital scanning system to create fast, precise 3D digital images of your teeth. Then we will map out a precise treatment plan, including the exact movements of your teeth and how long your treatment will be. You’ll even get to see how your teeth will move and preview your new smile. As you wear each set of aligners, your teeth will gently and gradually shift into place. We may recommend that you begin wearing a new set of aligners every week and schedule checkups every 8-12 weeks. 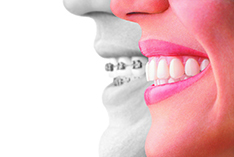 When your treatment is complete, we will fabricate custom-made retainers for you.